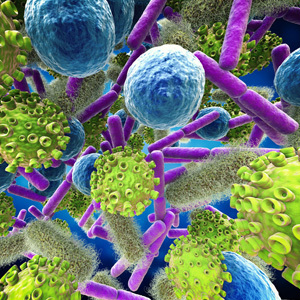 Most people associate bacteria with disease and ill health. But the real story about the trillions of microscopic organisms now living in and on your body is a bit more complicated. With recent advances in genetic code research scientists are learning that many of these microorganisms you’re hosting are actually beneficial for you — including your teeth and gums. Beginning at birth and throughout your lifetime you are continually developing a distinct microbiome — actual communities of bacteria and other microorganisms that inhabit your body. As your microbiome develops it helps train your immune system to distinguish between “good” bacteria that help with digestion and other bodily processes and “bad” bacteria that cause disease.Â And it continually adapts to changes in what we eat, the pets we acquire or the drugs we take. But lifestyle choices like diet can also have a detrimental effect, causing harmful bacteria to become dominant. This seems to be the case with Streptococcus mutans, the bacterial strain most associated with tooth decay. Scientists have analyzed biofilm (plaque deposits on teeth) from the pre-industrial era before 1900 and compared it with modern biofilm samples. They’ve found Streptococcus mutans levels to be much higher in modern biofilm, which they directly attribute to the modern Western diet. As we gain a better understanding of these findings and of the role of bacteria in our lives, it could change many health recommendations not only about diet but about medications too. In the fight against disease, for example, we’ve used antibiotics to eradicate infection-causing microorganisms, but with a broad destructive ability that can also kill many beneficial strains of bacteria. It’s hoped as our knowledge grows we’ll be able to create newer drugs that more narrowly target harmful microorganisms while not affecting beneficial ones. There’s a new appreciation emerging for bacteria’s role in our lives. As a result efforts to rebalance a person’s microbiome when they become sick may eventually become a critical element in healthcare treatment strategies. The benefits of this strategy for health, including for our teeth and gums, could be quite impressive.